Water risks once again rank as one of the top 10 global risks in the 2016 World Economic Forum’s annual report. Because of this, more and more companies view water as a business risk and water stewardship as a solution. As such, they are looking to find ways to measure their performance and progress. 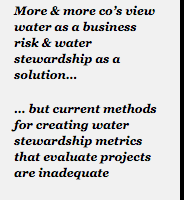 However, current methods for creating water stewardship metrics that evaluate on-the-ground projects are inadequate. 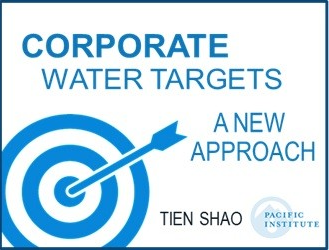 Corporate water targets are often developed with various objectives in mind. Sometimes they are used to demonstrate the company’s leadership to external audience. Sometimes they are used to inform and inspire employees internally. Sometimes they are used to align water efforts across the company’s operations in various regions. And sometimes they are used to mark the company’s contributions to addressing global challenges. Finding ways to align corporate water targets to public policy and international global policy, such as the Sustainable Development Goals, ensures corporate water targets address global water challenges. At the same time, each river basin is unique and requires a unique type and degree of action. This complexity of understanding and responding to local needs, while also contributing to global development goals brings a great deal of complexity to corporate water target setting. That’s why CDP, UN Global Compact CEO Water Mandate, Nature Conservancy, World Resources Institute and WWF published a new discussion paper calling for a new approach to set context-based corporate water targets. We believe through creating guidance on the topic, we can assist companies in navigating this complex, yet vital, water stewardship challenge. 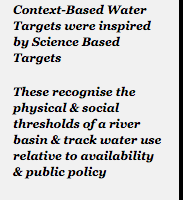 What are Context-Based Water Targets? Context-Based Water Targets were inspired by Science Based Targets for climate change, where companies set corporate targets consistent with the right level of carbonization based on science. This approach allows companies to make an appropriate contribution to the overarching goal of limiting warming to less than 2°C. Context-Based Water Targets, therefore, recognise the physical and social thresholds of the relevant river basin and track water use relative to the basin’s thresholds/availability and its alignment with public policy and other water goals. One example might be a facility’s water use goal developed as a fair share of the basin’s water resources. One of the challenges is determining fair share allocation, which is typically set by the public sector considering multiple variables including environmental flows. By using each basin’s unique conditions to inform targets, companies can establish performance targets that contribute not only to public policy objectives, but also to a basin’s water risk reduction. This approach helps companies effectively mitigate water risk and secure sustainable clean water supplies. Existing integrated basin management priorities and goals – Water stewardship targets are most effective when established in a social, economic, environmental, and political context in which food, energy, water, and ecosystem security for all is in balance. The local basin context – Meaningful targets are more sustainable when founded in scientific understanding as well as in the socioeconomic, political, and hydrological context to ensure sustainability. It is also more sustainable when possible targets align with ongoing public policy dialogues and company initiatives. The multi-issue nature of water – Water stewardship outcomes tend to be more lasting when they align with the six areas outlined in Sustainable Development Goal(SDG) 6, consider linkages to the water-food-energy-ecosystem nexus, and drive social and economic development within local contextual constraints. Equitable allocation methods rooted in good water governance – The attainment of corporate-based water targets (CBWTs) tends to be more successful when (1) informed by the sustainability of the basin and the company’s share of responsibility, and (2) tied to notions of good water governance and other shared basin goals. Arriving at shared goals and responsibilities may be formal or informal, but it is central to basin sustainability. Data constraints and needs – Data remain a critical element in any context-based target approach. Any proposed approach tends to be more effective when based on a realistic assessment of what data is available for all stakeholders in the near-term, as well as, when possible, ongoing links to data monitoring systems and sharing water data. The need to be company-relevant – CBWTs tend to be more effective when they are applicable for company decision-making and corporate strategy, including scenario analysis and horizon planning, and when they tie back to actual water risk and investor concerns. Target setting must be supported by measurable, meaningful, and pragmatic methodologies for companies across a full value chain, from raw material sourcing all the way to consumer product use. How can Companies Develop Context-Based Corporate Water Targets? 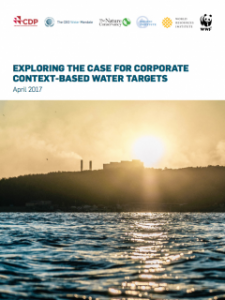 Companies can develop more impactful corporate water targets by considering the basin’s local context, including a scientific foundation, aligning with public and private sector initiatives, and involving stakeholders. This is shown through WRI’s work with Mars who identified science-based corporate targets to track the company’s progress. WRI recommended using a scientific foundation of total water withdrawals within the watershed that should be at or below 40 percent of the annual average renewable available supplies as identified by the UN water stress scale. We recognise that a shift to context-based water targets will not occur overnight. Furthermore, we recognise that these changes are not starting from scratch; companies have a long history of working on water issues in context and, indeed, acknowledging context in their water targets. 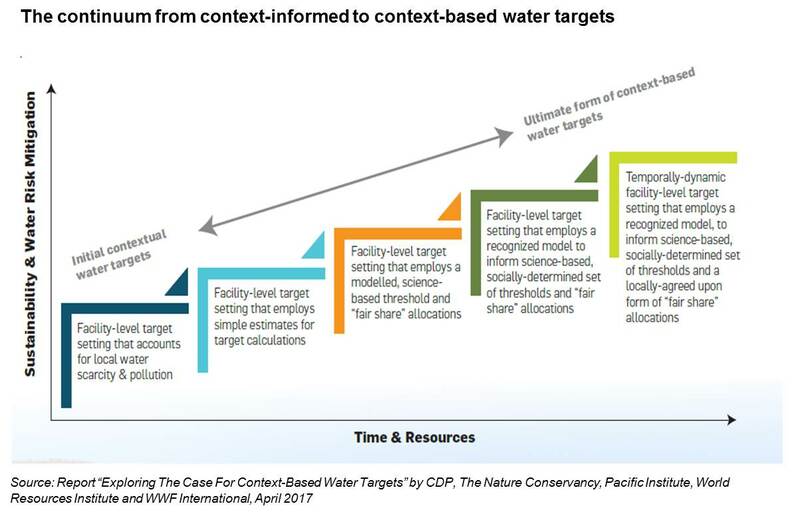 We believe that a continuum of approaches (see image below) will likely be required as companies shift from contextual to stronger forms of context-based water targets that include more robust, consensus-driven processes. Currently, we are looking for companies that are interested in pilot testing the Context-Based Water Targets approach or to participate in the Advisory Committee or the Stakeholder Consultation Group. Don’t you think it is time to join this important and timely endeavour?